At Manor Community Childcare Centre we carefully select our staff for their dedication and enjoyment of caring for children to the high standards you would expect as a parent. It is the aim of the Nursery to provide the highest standard of care and ensure we have the best staff possible for this. We believe they are the most important resource in our Nursery. We are fortunate in having experienced and qualified staff, many whom have been with us for several years providing consistency of care. All of our Senior staff, Senior Early Years Practitioners and Early Years Practitioners have a recognised childcare qualification equivalent to NVQ Level 3 or above. 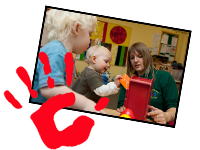 Assistant Early Years Practitioners are either qualified or working towards to an NVQ Level 3. All of our staff have an up to date Enhanced CRB (Criminal Records Bureau) check.High quality staff gives your child a higher standard of education. We have a qualified teacher in the nursery 4 days per week and also have a Lead Early Years Practitioner to oversee the curriculum, support staff in the delivery of the EYFS and supporting planning.